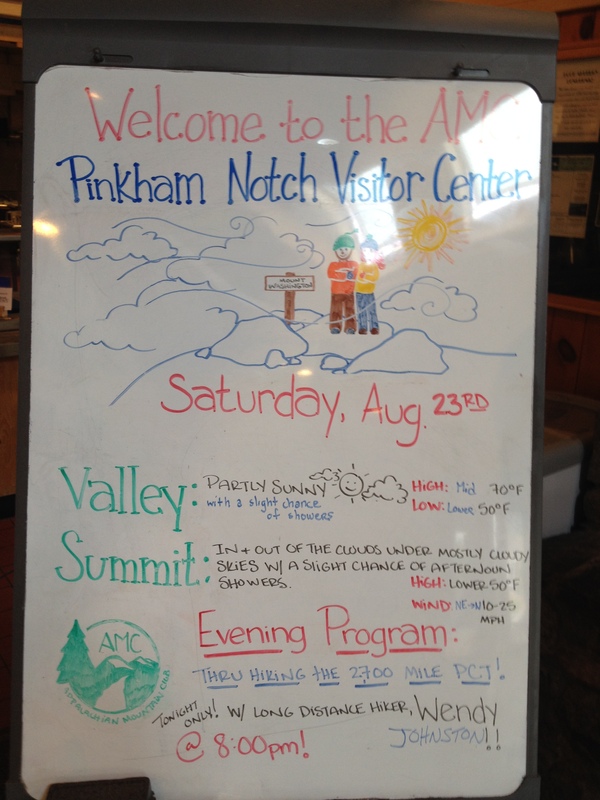 All summer long, I knew that, at the very least, I would get one long hiking weekend up in the White Mountains, as I had scheduled a talk at Pinkham Notch on Saturday, August 23rd. 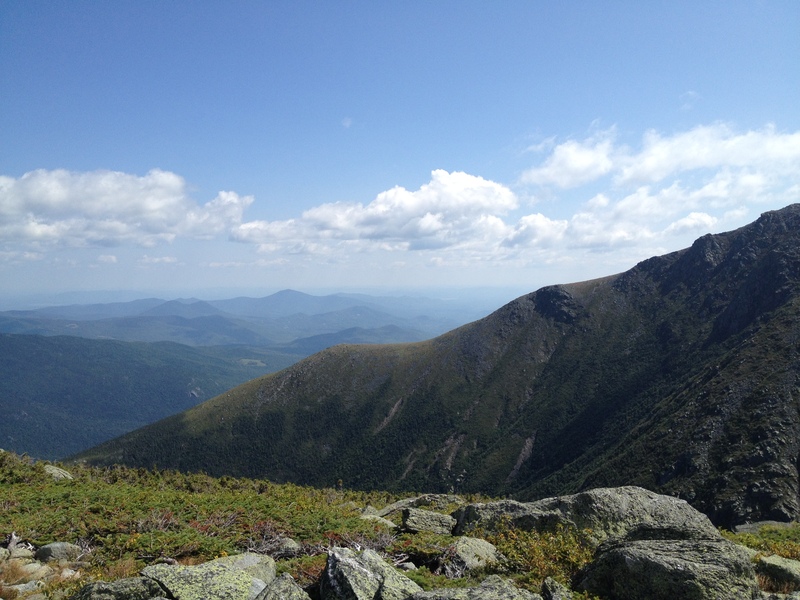 I had planned on driving up to the White Mountains after teaching my yoga class in Cambridge on Thursday afternoon, staying with some friends from the PCT for a couple of nights, getting in a few hikes, hopefully learning some navigational skills, and then giving my talk on Saturday evening at Pinkham Notch. I really hoped to have some of my friends join me for some hiking time after a year of trying, but I once again had to adjust my hopes and try to stay open to yet another solo experience. That Monday afternoon, one of the librarians called me to ask if I would come to their bookclub on Thursday night to discuss “Wild.” I wished that she had asked me earlier as I like to plan my schedule ahead of time, and this short notice didn’t give me enough time to re-read the book before then. I was also still quite sick, in the depths of my cold, at the time. After thinking over my options, I decided to go to the meeting. Since Friday was supposed to be a rainy day, I figured that another day of rest wouldn’t hurt. I cut my one summer trip down to 2 days. At least I could squeeze in a climb up Mt. 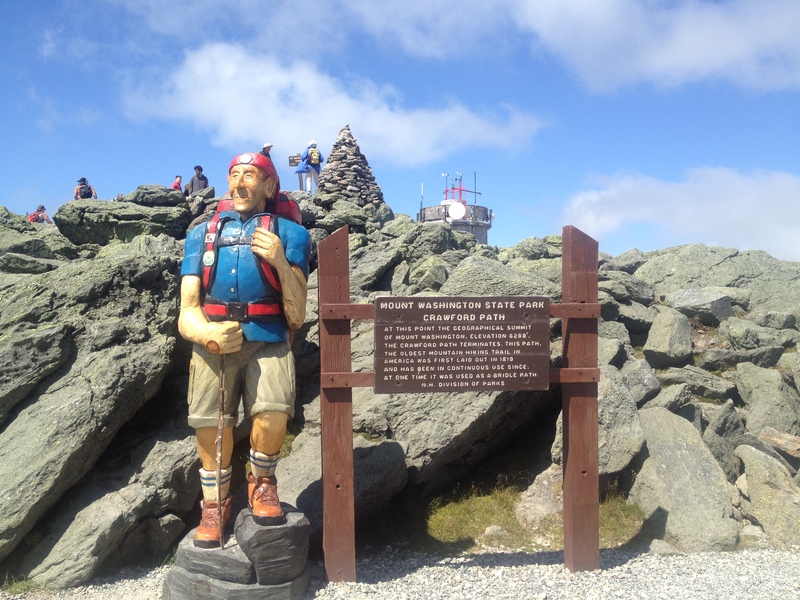 Washington and do a loop on Franconia Ridge- my two favorite hikes in the White Mountains. However, after eating my usual breakfast early Saturday morning, I was suddenly and surprisingly gripped by extremely intense intestinal pain! While taking a couple of courses of 200 billion probiotics, my stomach pain finally began to lessen, but after returning to the 80 billion strength, it started coming back. On this day, it was as worse as it could be. I didn’t even know if I could drive! 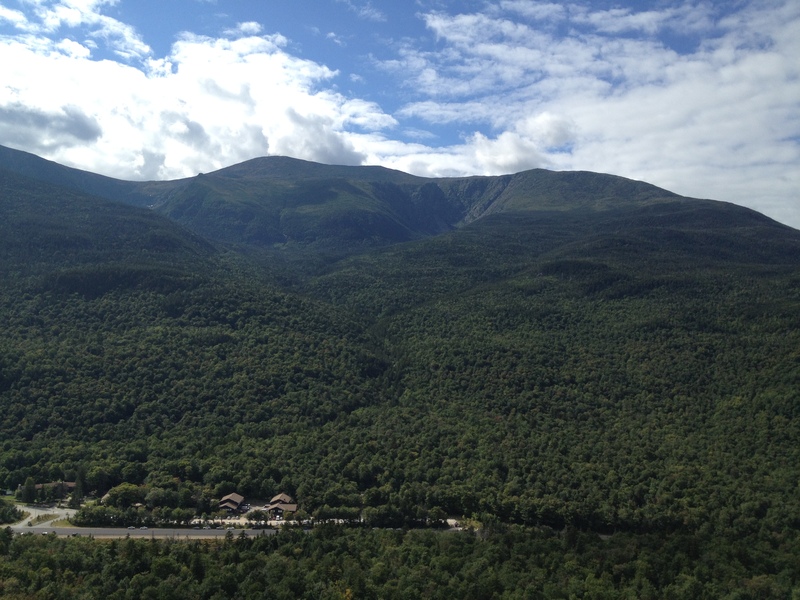 I hoped it would dissipate over the next three hours, but when I arrived at Pinkham notch to a completely full parking lot, the pain had not subsided at all. I waited until someone pulled out of their space and then slowly walked into the visitor center with my hand over my belly to find out if my room was available. In exchange for my presentation, they gave me a night’s stay with breakfast and dinner. I was told to go over to Joe Dodge Lodge and ask there. I could barely move due to the intensity of the pain. The woman at the lodge said that it was too early for my room to be ready. Maybe I would have to lie down in my car or on the lawn. All I knew was that I needed some place to lie down immediately. Then, she looked up my room and said that maybe it was ready after all. It was in another building, which she drew a map to. “If the room isn’t clean, just leave your luggage in there.” When I reached the room with the two tiny twin beds, I decided that it was clean enough and immediately got under the covers of one of the beds. It was so cold in there! I wondered why there weren’t any towels, but figured I could ask for some at Joe Dodge Lodge. At some point, I noticed a pillowcase sack with something inside it on the other bed. Maybe my towels were in there! At 1:00, I decided that I should get up and at least go outside and be in the sun like a normal person. I could continue reading my book and then go over my talk. I got up and looked inside the pillowcase. Used towels were inside! I peeled back the comforter on the opposite bed and realized the room had not been cleaned yet! While I was using the bathroom down the hall, two girls came to my room to start preparing it! I was so glad that I had gotten up when I did! I walked out to my car, ate a snack, and then took my rain jacket and bottle of water and headed across the street. 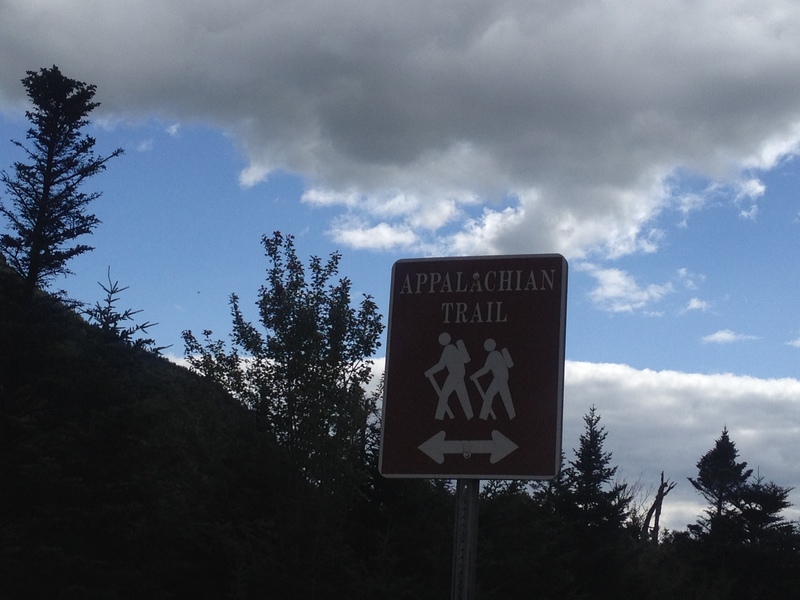 I knew there were a couple of short walks on that side of the notch and I decided that I could check out the Appalachian Trail as it headed toward the Wildcats and see what memories came back. I quickly regretted not bringing my poles with me. What was I thinking? Every step of the AT is uneven surface, requiring a lot of dexterity and balance. It’s also a very muddy trail! The moist forest was a great contrast to the PCT! I took in the smells and feeling of the forest and then paused in front of the Square Ledge sign, wondering if I should head up there or continue walking toward Lost Pond. I decided I would hike up to the ledge after re-visiting the AT. Along the way, I practiced my talk. Memories of my Appalachian Trail hike did not resurface as I walked the path, but I did remember the time that Erik and I walked to Lost Pond the day after climbing Mt. Washington one year. Our legs were too sore to attempt another big mountain the following day. 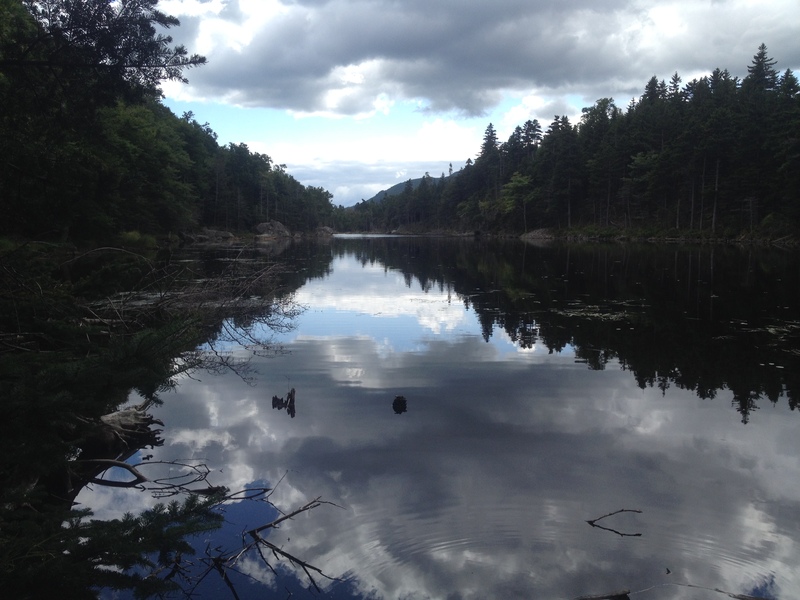 I remember sitting on a rock in the pond, looking at the beaver dam and feeling that If I just came out and sat quietly in nature like I was doing then, I would feel like writing. I continued past the pond until the trail became too tough to maneuver without poles. The AT is difficult! I have never had a desire to hike that trail again. I saw a squirrel nibbling on an acorn and sat against a rock, enjoying its company for the time it remained there. I miss having animal companions. Once I reached the Square Ledge junction again, I turned up its path. Mosquitoes bit my legs as I ascended. Then, suddenly, in front of me, I saw a man couching down, facing me, with something pointing at me from his chest. Something was happening, but I couldn’t register what. He stayed in the same position, aiming the large object straight at me. I thought it was a gun he was pointing and although I couldn’t understand why, I thought he might be about to shoot me. Then, I realized it was a large camera, and he was facing me without moving to alert me to the presence of an animal nearby. I held still and looked into the trees, not knowing what was over there. A bear, maybe? It took me at least a minute to see that it was a moose, casually chewing on the leaves of the trees! A smile came over my face and the man, his girlfriend and I exchanged silent expressions of awe. When they started moving to get a better view, I moved too. I wasn’t able to get a picture of it with my little camera, due to the tree coverage, but it was nice to be in its presence for awhile. “Amazing!” the man said as he passed me. I discovered that this couple was from Germany. The woman was very pretty, smelled really nice, and wore a fashionable scarf bunched up around her neck. I wondered why I never looked like that! We continued to whisper after the moose had turned back into the woods and then parted ways. Once on top of the ledge, I reflected on the extraordinary timing of the day’s events so far. Had I been feeling okay, I would have been climbing up Mt. Washington at that point. Had I not chosen to get up from my nap when I did, I would have both startled and been startled by the cleaning girls! What if I decided to climb up to Square Ledge before I walked to the pond? I probably would not have seen the moose! It was all so fascinating. Dinner was a very lonesome affair for me. I couldn’t even make proper use of the buffet because of the way my stomach was feeling. I decided to head back to my room and read for a bit before returning to set up for my talk. One girl told me to be there around 7:30, but at 7:40, another one said to come back in 10 or 15 minutes… About a month ago, I had asked if they had the connecting cord I needed and was told yes. Now, the girl said, “Hopefully we have it…”. There wasn’t much concern about how or what I was about to present. After a lot of trial, the connections were finally made, although the cord wasn’t long enough for me to have my laptop near the screen. It had to sit on top of the projector and I would have to keep walking back and forth to advance the images for the talk portion of my presentation. It was scheduled for 8:00, but no one had come into the dining room by then. When the first man arrived, I said, “My audience!”. Gradually, several more people trickled in. It was the first time that I was not introduced in any capacity. I explained that I would have to keep walking back to the laptop to advance the slides. I had to compete with the loud clanging of clean-up in the kitchen while I talked, and I realized that this was not a good environment for my presentation, as it is more of a formal one than the ones usually held here and one that requires the full attention of the audience. One thing that did strike me as my slideshow was playing, was that the scenery of the west coast greatly contrasted and stood out against the scenery of the Appalachian Mountains- something not apparent in a library setting. Several of the kitchen workers came out to watch at various intervals. One woman stood by me, staring at the screen. “Did you do all of this yourself?”. “What’s your name?” “Have you written a book?”. “Not yet. But I will,” I said assuredly. One man had to leave about 1/2 through the slideshow to check on his daughter. He rubbed my back on his way out and thanked me for sharing my story. Another man came up to me afterwards and said that, coincidentally, he was on his way to Yosemite the next day and showed me a piece of paper in a ziplock bag. It was his PCT permit from his 1981 thru-hike! He said that he was interested in seeing how it had changed since then. He asked what I am doing now and when I said I wanted to build my own life, he said he could tell. “I can see that you’ve been through a lot,” he said, rubbing my arm. I returned to my room and finished my second reading of “Wild”. After having hiked the trail, myself, in between my first and second readings, having learned a lot more about Cheryl Strayed in the meantime, as well as about life itself, my experience of reading the book was different this time around. A couple of passages really struck me. Many of my life experiences are quite similar to hers. 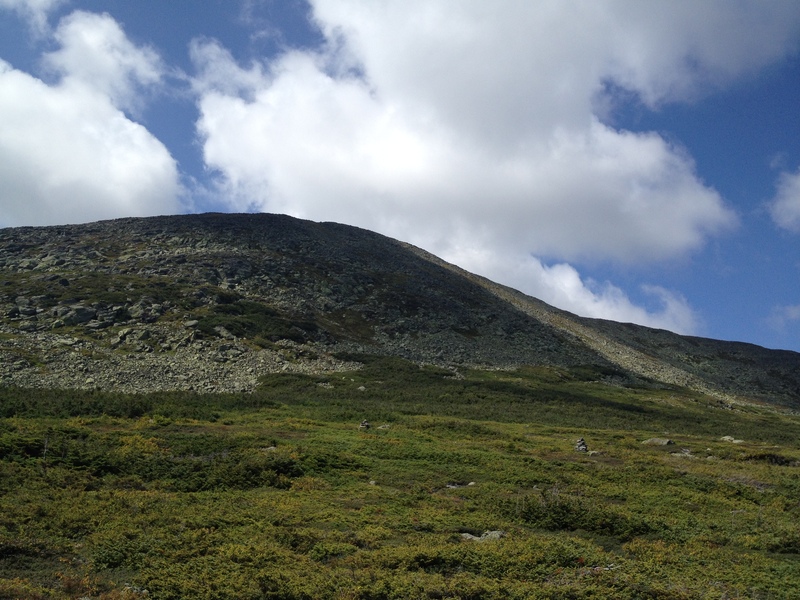 The following morning, I slept in a bit later than I had planned on, ate another lonely breakfast, packed up my things, returned my room key, and started up Tuckerman’s Ravine at 9:12. I was carrying about 13 pounds on my back with just extra clothing, water, and snacks. Since I hadn’t hiked in nearly a year, had been sick and just resting for the past two weeks, and thinking that all traces of competitive feelings had been removed from me, I just steadily walked. I hoped that I could make it to the top in three or even three and a half hours and didn’t try to race in any form. Steadily, I began passing each group of people, one by one. At one point, there were three guys behind me (one with a bear bell) that weren’t dropping behind. I continued to press on and soon enough, they fell back. I passed another man who was profusely sweating. “Is this almost over?” he asked. I told him that we would reach a nice break spot soon. His companion, who was obviously overweight and out of shape, raced ahead of me, jogging up the rocks with a smile on his face. I wanted to suggest that it might be wise to conserve his energy… He still had a long way to go. But I kept my thoughts to myself. It amused me to see former spots that Erik and I had taken breaks at in earlier years (or saw other people resting at) because it seemed so early on in the hike! I also realized that not everyone has the capability of climbing this mountain. “Have I gone as far as I went last year?” an older man asked his companion. I reached Hermit Lake in just over one hour, took off my pack to finally put my hair up, and adjusted my pack that had been chafing my back. Then, I continued on. There was one group of younger people who I let pass me as I climbed beside the melted snow. We overlapped a couple of times. At the base of the cone, they all stopped to take a snack break at the base of the cone, but I did not need a break. (Aha!) And so I kept climbing. 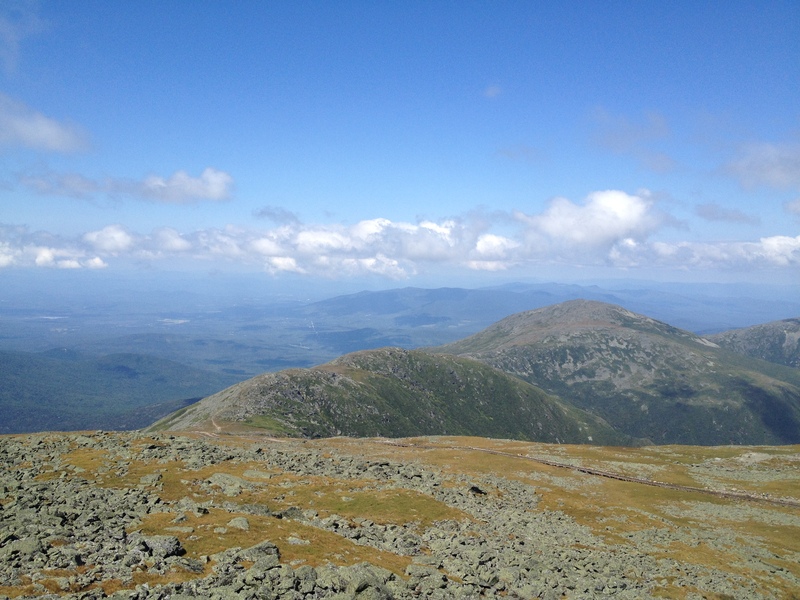 A mass of people was spread out in all directions, unable to find the path to the summit. I remembered that in earlier years, I was so out of shape, that I had to crawl up these rocks like a beetle! This time was the easiest of all for me. Just before the top, my shin hit a rock and bruised. Only the wooden steps remained and a big smile spread across my face. My legs felt heavy going up them, but I did not feel tired. I looked at my watch outside of the visitor’s center. I had reached the top in 2 hours and 35 minutes! And I wasn’t even trying! At my oldest age, my body seems to be in the best shape of my life! And I don’t do cardio exercise anymore! Inside, I perused the snack bar and decided on a hot chocolate and chocolate chop cookies. I headed towards a table by the windows and spotted a man in a kilt. I found the thru-hikers! My people! I headed over to them and drew in their scent for a breath, which was just as familiar and attractive to me as the flowery, clean scent of the German tourist! I sat and watched them when they sat back down at their table. They looked tired and zoned out. One of them was entertaining himself (and me) by flipping his water bottle into the air and catching it on his forearm. I was fascinated and amused. Thru-hiker self entertainment! And then, they were off- to who knows where! As I ate my cookies, another couple asked if they could join me. The young man looked very tired and said he was so happy to sit for awhile. His shoulders slumped forward as he opened his tupperware container of peanut butter and jelly sandwiches. I remembered what it felt like to be tired like that after the climb, but on this day, I felt perfectly fine! I headed outside to take a few pictures on this beautifully clear day (those thru-hikers lucked out!) and even witnessed the moments just after a marriage proposal. The wheel of life keeps on turning. An hour and a half after I arrived, I headed down. As I looked below me, I saw a mass of people on their way up! 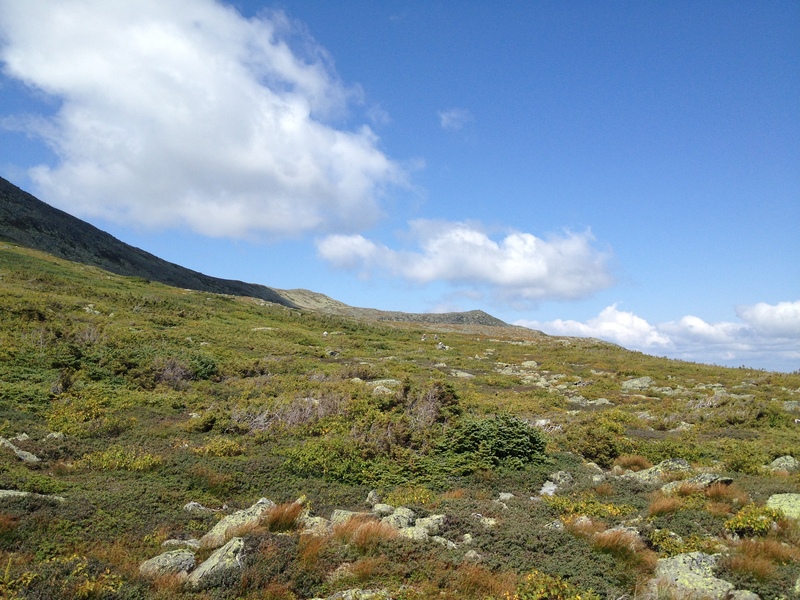 I veered off at the Lion’s Head turn-off, avoiding the majority of people ascending and descending Tuckerman’s, but a number of people took this path, as well. 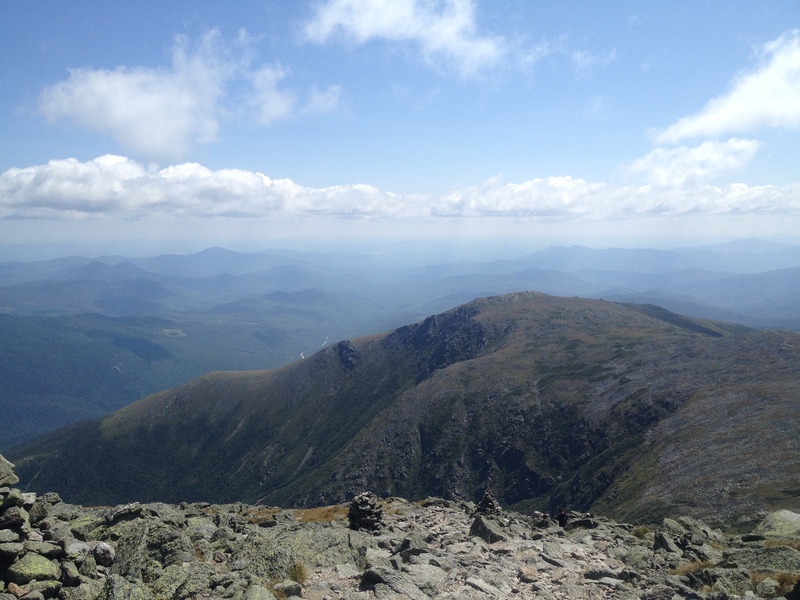 I realized that I probably seem a bit competitive when climbing this particular mountain because it is SO crowded and I desperately crave my own space. Steadily, I made my way down the mountain. I am still so slow and unsure while descending, but I realized that I am very consistent. Towards the bottom of the mountain, a younger couple who had been in my vicinity a lot acknowledged me for the first time while taking a water break. “You keep a strong pace!” the young man said. I told them that we all essentially hiked the same pace and they seemed to like that. Three hours and 15 minutes later, I reached the bottom, threw my things into my car, changed into my sandals, headed to town for a solo dinner, and then drove the 3 hours home.